meant it became a mainly British operation. Before the attack, the British implemented a week-long bombardment of the German front lines in an attempt to shatter the German defences. The Illustrated London News remarked that “not a roof was left on any of the houses” in the village of Montbauan, near the Somme, and that “all had been shattered by our bombardment”. However, the German trenches were heavily fortified and the bombardment failed to destroy their front-line barbed wire or their robust concrete bunkers. Consequently, the German forces simply went underground and waited for the bombing to cease. On 1 July 1916, 11 British divisions advanced to the German lines and were quickly met with machine-gun fire. By the end of the first day, the British had suffered 60,000 casualties, their largest single loss up to this point in the war. Douglas, Haig, Commander of the British Expeditionary Force, ordered his troops to continue the offensive for the next few days, with little success. The next two months saw an arduous stalemate. On 15 September, Haig renewed the attack with the help of tanks, though they were primitive at this stage and made little impact. However, The Sphere reported that a Canadian regiment had enjoyed some success in capturing the village of Courcelette. Heavy rain soon turned the battlefield into a muddy swamp-like arena and in November the fighting ceased. The British had suffered roughly 420,000 casualties and had only advanced five miles. Today, the Somme Offensive and Haig’s tactics of sending wave after wave of men to “wear down the enemy” are typically considered to have been a naive and senseless response to the demands of trench warfare. The rate of casualties as well as depictions of the battle as a “horrific slaughter” in war poetry have helped to solidify the Somme as one of the greatest atrocities in the First World War. publications, portray the Somme as a glorious Allied victory. 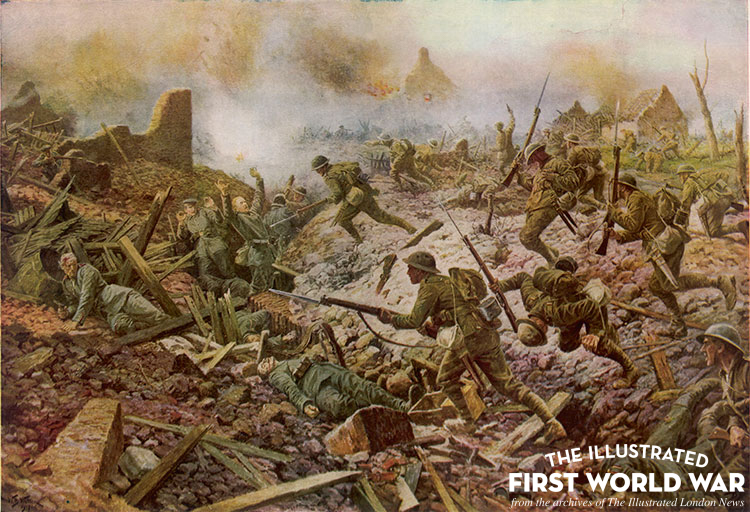 The ILN published articles about British war films that depicted the Somme as “an epic of self-sacrifice and gallantry”. Haig himself became a popular figure in the public sphere as a result, “chiefly [because] of the great Battle of the Somme with its remarkable ‘pushes’”.